Mr. Manfred Schnetzer, a longtime member of the Kolping Society, will perform the honorary tapping promptly at 7pm, but the event runs from 5pm to midnight. In addition to the ceremony, Mr. Greg Hardman, President and CEO of Christian Moerlein Brewing Co., will give a brief presentation. The event will feature live music by Die Vereinsmusikanten, German food, and the raffling of many unique items. A large stein collection will be on display with items for purchase. 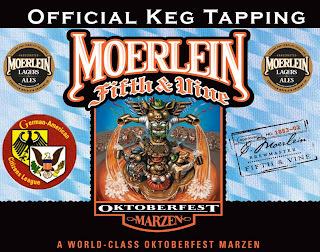 Moerlein Artist Jim Effler will be on hand to sign Commemorative Moerlein Oktoberfest posters. Admission and parking are both free. If you’ve never tried Oktoberfest before, it’s delicious. Whether you can make it to the event or not, I recommend picking up a sixer to get you in the spirit.